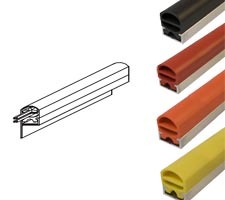 High sensitivity sensing edges were designed with limited space and highly sensitive applications in mind. These highly sensitive strips require a minimal 2.2 lbs. of force to activate. 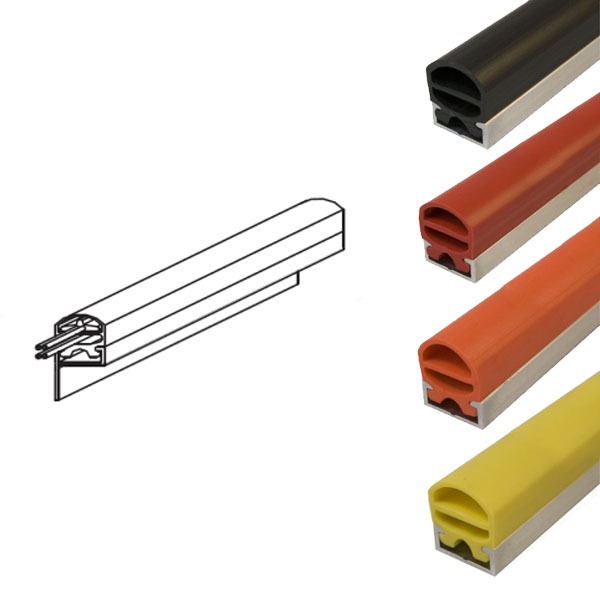 The edges on these strips have a PVC housing which makes them resistant to water, oil, hydraulic fluid and coolant. The switching element contained in the strip is rated for a whopping 3 million operations at any point. The sensing edges listed here mount into a snap-in channel made of aluminum. 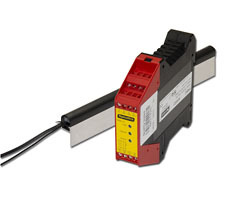 This channel features a right-angle mounting edge for easy alignment with any straight edge. (Flat channels are also available - please call for details.) 1 controller (details below) is also included with each sensing edge. Available in Black, Red, Orange or Yellow colors - specify in 'Notes' field at time of order. If no color specified, the default color is Black. *This is a very simplified description of the principal behind these sensors. Here is the full description - direct from the manufacturer. 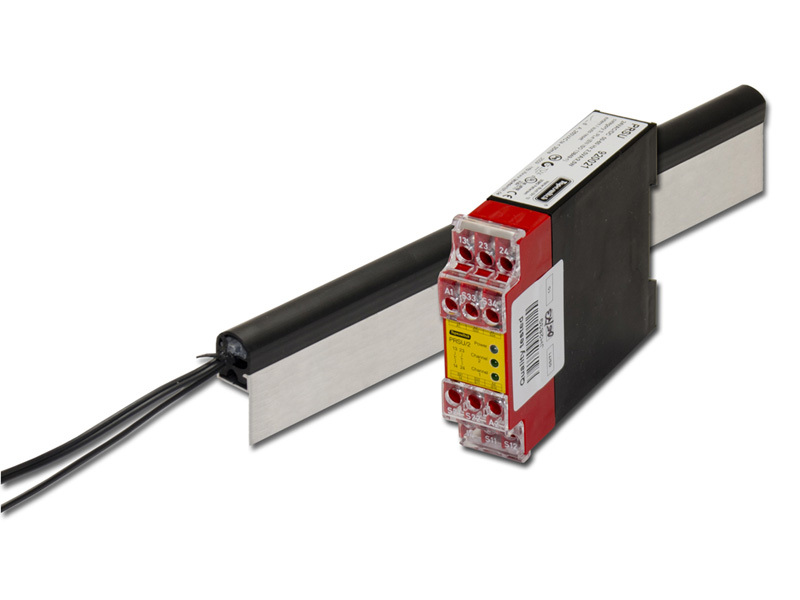 A small current is constantly flowing through the sensor at all times, holding the relay coil energized at all times. 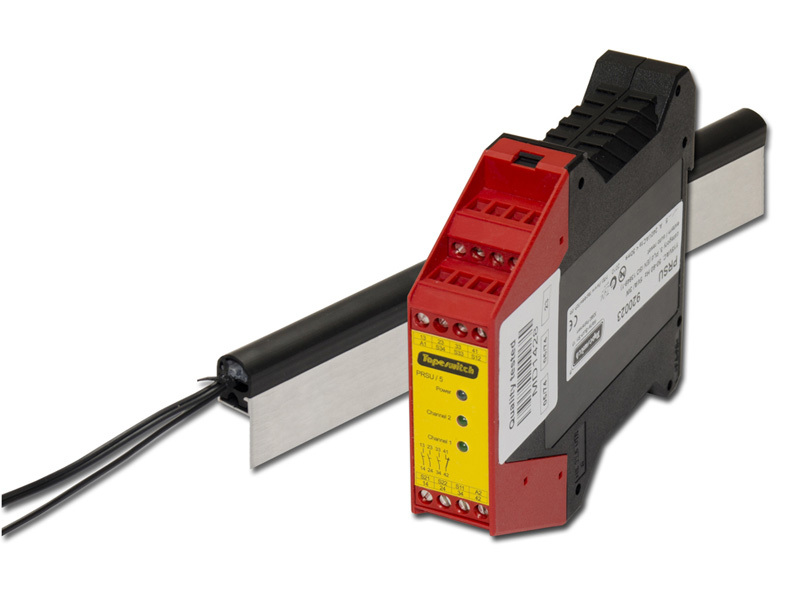 The machine controls, interrupt, or stop circuitry is connected to the contacts of this relay. If the sensor is actuated, the relay coil will be shorted, causing the relay to de-energize. 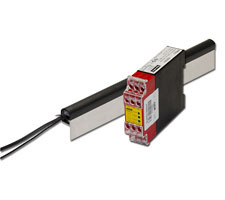 A resistor in series provides current limiting from overdrawing the power supply and limits the current through the sensor in the actuated position. If the sensor fails in the closed position the relay will be shorted and cannot be energized until the failure is corrected. If the sensor fails in the open position, the current path for the relay coil no longer exists and the relay coil cannot be energized until the current path is restored and the failure corrected.